What is the Right Dehydroepiandrosterone (DHEA) Dose? The question remains, “How much oral supplemental DHEA is appropriate?” DHEA dose responsiveness appears to depend upon the indication and the patient’s need. 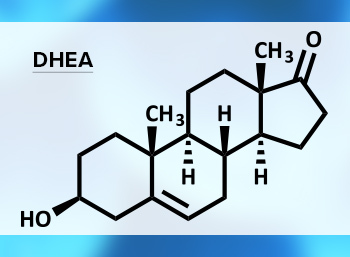 DHEA is a precursor to several other hormones which ultimately result in the formation of androgens such as androstenediol or testosterone and estrogens such as estrone, estradiol, and estriol. When supporting the healthy production of the aforementioned hormones, it is prudent to attend to the pleiotropic functions of these hormones as they affect a myriad of systems in the body. For this reason, I support and encourage periodic laboratory testing to confirm that the levels of DHEA remain in the optimal range. DHEA sulfate (DHEA-S) can also be measured in serum and saliva. In order to understand the best approach to DHEA dosing, specific goals should be determined. Available research provides validation for a variety of dosing levels based on these goals. Christopher Oswald, DC, CNS is a chiropractor, certified nutrition specialist, and a graduate of Northwestern Health Sciences University. He practices at Hudson Headache in Wisconsin, focusing on whole body care for those suffering from head and neck pain. In practice he utilizes the combination of functional movement assessment and functional medicine principles to identify the underlying causes, which guides his direction for the appropriate clinical care. Additionally, he is an Advisory Board Member of Nordic Naturals, and the National Association of Nutrition Professionals. Weiss EP, Shah K, Fontana L, et al. Dehydroepiandrosterone replacement therapy in older adults: 1- and 2-y effects on bone. Am J Clin Nutr. 2009 May; 89(5): 1459–67. Dong Y, Zheng P. Dehydroepiandrosterone sulphate: action and mechanism in the brain. J Neuroendocrinol. 2012 Jan;24(1):215-24. Khorram O, Vu L, Yen SS. Activation of immune function by dehydroepiandrosterone (DHEA) in age-advanced men. J Gerontol A Biol Sci Med Sci. 1997 Jan;52(1):M1-7. Mayo Clinic. DHEA. Available at: http://www.mayoclinic.org/drugs-supplements/dhea/evidence/hrb-20059173. Yamada S, Akishita M, Fukai S, et al. Effects of dehydroepiandrosterone supplementation on cognitive function and activities of daily living in older women with mild to moderate cognitive impairment. Geriatr Gerontol Int. 2010 Oct;10(4):280-7. Brooke AM, Kalingag LA, Miraki-Moud F, et al. Dehydroepiandrosterone improves psychological well-being in male and female hypopituitary patients on maintenance growth hormone replacement. J Clin Endocrinol Metab. 2006 Oct; 91(10):3773-9. Reiter WJ, Pycha A, Schatzl G, et al. Dehydroepiandrosterone in the treatment of erectile dysfunction: a prospective, double-blind, randomized, placebo-controlled study. Urology. 1999 Mar;53(3):590-4; discussion 594-5. Chang D, Chu S, Chen H, Kuo S, Lai J. Dehydroepiandrosterone suppresses interleukin 10 synthesis in women with systemic lupus erythematosus. Annals of the Rheumatic Diseases. 2004;63(12):1623-6. Ceresini G, Morganti S, Rebecchi I, et al. Evaluation of the circadian profiles of serum dehydroepiandrosterone (DHEA), cortisol, and cortisol/DHEA molar ratio after a single oral administration of DHEA in elderly subjects. Metabolism. 2000 Apr;49(4):548-51.